As the Director of Cape South - a hotel specialized on holistic health - Blair Morgan is passionate about helping people to achieve full health and wellbeing. 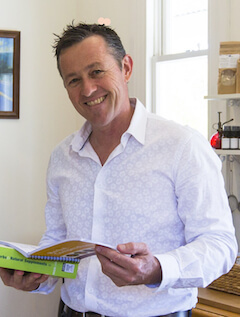 He specialises in complex health disorders and chronic conditions, and through therapy, supplement, diet and lifestyle changes he assists people to take back their lives in a richer and more fulfilling way. Blair was recently awarded Graduate Medical Herbalist of the Year by the New Zealand Association of Medical Herbalists, and now continues his clinics towards helping all people, with a particular focus on men’s health. Blair is registered with the New Zealand Association of Medical Herbalists and The New Zealand Society of Naturopaths.